I must apologise for not blogging for so long... going through a change in jobs is pretty darn stressful!! It has kept me from my creative endeavours, and means I've not had much to share with you all. Until now, that is! I have been crocheting a doll for quite a random purpose. You see, I am very fond of my current manager, and he has frequently said "what I am going to do without you?" 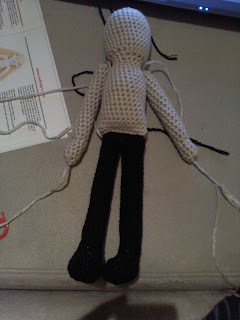 over the past 4 weeks, so I decided to make him a little reminder of me - a 'diddy Becs' doll! Kind of like a mini-me, but crocheted! I have to give credit where it is due, as I based the body of my doll on that of one designed by Michele Wilcox. The pattern can be found here. So, I sat down with some beautiful bamboo acrylic and started to crochet myself from the top down, using nothing but single crochet (with increases and decreases in the right places). It's a well written pattern and was easy to follow. I love amigurumi, so it was good fun to make. I decided not to go the whole hog and crochet the underwear into the body, especially as this is a gift for a man... I felt it might feel slightly inappropriate! So, the head, body and arms were made in a beige bamboo acrylic and I decided that instead of making trousers for the doll (no idea how I'd manage that anyway!) I'd just make the legs from black acrylic! Now I had to decide what top/dress the doll should wear - this was an easy decision to make as I have a rather unique green dress/tunic that I wear to work - it's very distinctive, and is unmistakably me! I had a yarn to match too... but it had to look like my tunic, so of course, there was no pattern to work from. I started crocheting a tube, starting at the bottom of the tunic, working up, tapering it as I went. I stopped when it was the right length under the armpits of the doll, and the rest of the tunic was crocheted onto the doll, which was really quite fiddly! To make the yoke of the dress and the start of the sleeves, I stitched around from the back until I met the arm, chain stitched a strap over the arm and joined it at the front of the dress, and continued around making a strap for the other arm. I then worked one row of single crochet to finish off the yoke. Then to make the sleeves... they were just single crochet tubes worked around the arms, and finished off at the wrists. The points at the bottom of the tunic were just worked in single crochet rows, decreasing one stitch per row to make them taper. 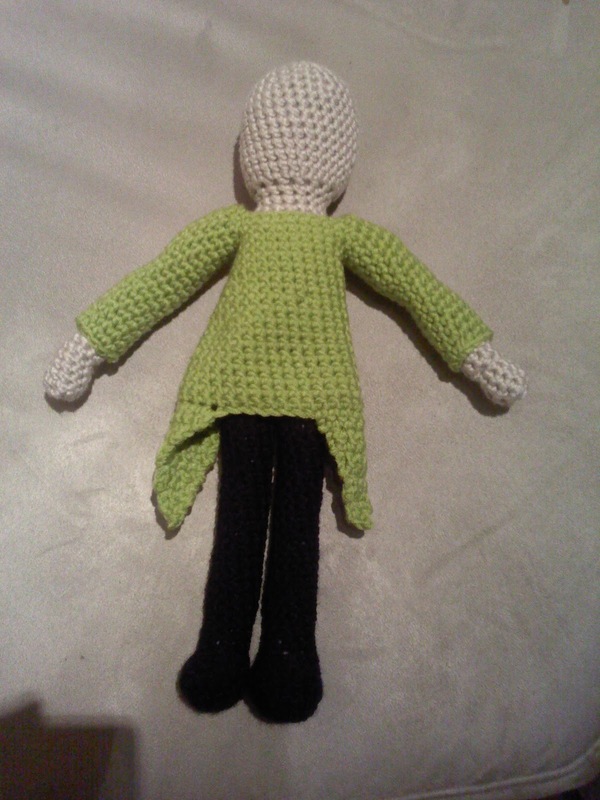 Now to make the doll look like a diddy-Becs... hair and facial features... The hair was more time consuming, and took a lot more yarn than I thought it would do. I used a gorgeous chocolate coloured cotton/bamboo mix, which is a little darker than my hair currently is, but is a very close match to a colour I had for a very long time. I have a rather asymmetric hair cut, so at least I didn't have to get it to match perfectly on both sides. The hair was made by cutting lengths of yarn, inserting a crochet hook through the stitches in the head, and pulling the folded yarn lengths through, and forming a little loop/knot to hold it in place. The eyes, I have to give credit to a good friend for - she suggested I made eyes from beads, as I'm well known for my beading at work... I had been planning to embroider them, but beads was a much better idea. The other thing I was told I had to include was a BIG smile... so out came the pink yarn!! Any representation of me without jewellery would be completely wrong, so I made a little beaded necklace from an earth-tone bead soup that I have been waiting for inspiration to strike with... it went so well with the colours of this doll, it seemed perfect!! I also wear glasses at work - this was going to put my wire-work skills to the test! But I managed to make a pair that look relatively like my work glasses, although mine are black, and these are silver... I didn't have any black wire in my stash, but never mind! So, this is me, with my Diddy-Becs... I just hope my manager likes her, and she reminds him of me, and all the cheeky, things I've said and done while he has been there. But mostly, I just want her to make him smile! Oh that is such a process for a cool little gift! And once again you look sooo cute together! So that's where that pic came from! I love stories like that, and big kudos to you on all the innovations. I love them too, but have not crocheted in years. So I finally picked up my crochet needle a couple of weeks ago, and started to make these adorable little penguins. I was stumped at row five, when it said to just crochet around. Never having made amigurimi, I didn't understand that I was making the body of it. So, all that to say, I'll probably be asking you some questions as I go along! I would love to make my daughter a doll like her. Thanks for the link to your blog!